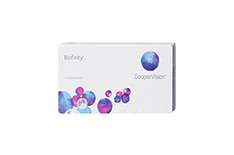 Biofinity is the extended-wear monthly lens from CooperVision. The lenses are so breathable that they can be worn continuously for up to 30 days, during the day and through the night. 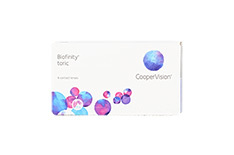 Biofinity contact lenses allow you to enjoy new levels of freedom and greater independence, liberating the wearer from the bother of daily cleaning and storage. 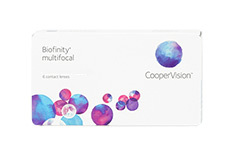 Biofinity is the cutting-edge product from CooperVision, featuring the innovative, patented material Aquaform. The lenses are ultra soft, and so comfortable that you’ll forget you’re even wearing lenses! Biofinity contact lenses have a light blue visibility tint which makes handling the lenses and finding them in their case child’s play. The lenses are available in a wide range of dioptres, from +8.00D to -12.00D, allowing a great many customers to experience the advantages of Biofinity. 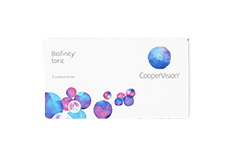 Thanks to their water content of 48% and extremely high levels of oxygen permeability (160Dk/t), Biofinity contact lenses ensure maximum comfort – for crystal clear vision with a healthy feel. 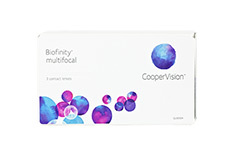 What’s more, Biofinity monthly lenses are free from additives, coatings, wetting agents and other surface treatments that can irritate the eye. 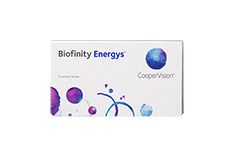 As a result Biofinity contact lenses are especially recommended for people with sensitive eyes.